The legendary Baikonur Cosmodrome, which sent the first man into space and launched dozens of Soyuz and Proton rockets for the ISS, marks its 60th birthday today. RT looks back at the breakthroughs of mankind's first and largest space launch facility. The Baikonur Cosmodrome was built when Kazakhstan was Soviet a republic, in 1955. It is now managed by both Russian Federal Space Agency and the Russian Aerospace Defense Forces. It’s where all manned Russian spacecraft lift off. The 6,750-square kilometer research facility still remains the busiest space launch facility in history. Baikonur includes nine launch pads, 14 rocket launchers and two airfields. The cosmodrome played an important role in operating and resupplying the ISS with Soyuz and Progress rockets. Many space firsts are associated with the facility: The first man in space, the first spacewalk and the first space station. Sputnik-1 was the first man-made satellite launched from Earth. In October 1957, it blasted off from Baikonur Cosmodrome, ushering in the space era. The satellite burned up in January 1958 after traveling some 70 million km and spending about 3 months in orbit. It collected valuable information about the higher layers of the atmosphere. The Sputnik’s success brought fame to the cosmodrome, whose construction was previously strictly classified. No one knew what exactly was being built and for what particular purpose. According to one of the legends around Baikonur, it was a stadium being built there. The world-famous first dogs to go into space, Belka and Strelka, returned safely aboard Sputnik-5 spaceship in 1960. After a series of incidents, involving the deaths of the dogs due to cold, overheating and technical failures, the dogs became worldwide heroes. More than 50 years later, in 2014, the authentic spacesuit worn by one of the dogs was sold at an auction for the “barking mad” price of $18,000. Twenty-seven-year-old Russian Cosmonaut Yuri Gagarin changed the space industry forever in 1961 with the first-ever journey into outer space aboard the spaceship Vostok-1, which was launched from Baikonur. The flight, which lasted 1 hour and 48 minutes, made history and the headlines worldwide. The first woman in space was Valentina Tereshkova, call sign Chaika (Seagull), in 1963. She spent almost three days (70 hours 50 minutes) on the Vostok-6 spacecraft, which was launched from Baikonur Cosmodrome. She orbited the Earth 49 times. The first spacewalk performed by Alexey Leonov became an epic hero tale reported and hailed in every major newspaper in the world five decades ego. The Soviet Cosmonaut made his famous jump into the silence of outer space, overcoming his own biggest personal challenge and marking a significant step in the history of space exploration. “Russian floats in space for 10 minutes; Leaves orbiting craft with a lifeline,” was the headline story featured in the New York Times half a century ago. Baikonur Cosmodrome was also involved in bringing the first modular inhabited research station in outer space - the famous Mir station (translated as Peace, or World). The main module was put into orbit in 1986. Until 2001 it was the largest satellite in orbit, succeeded by the International Space Station after Mir's orbit decayed. Baikonur was where the famous Soyuz rockets lifted off. The first one was launched from Baikonur in 1966. 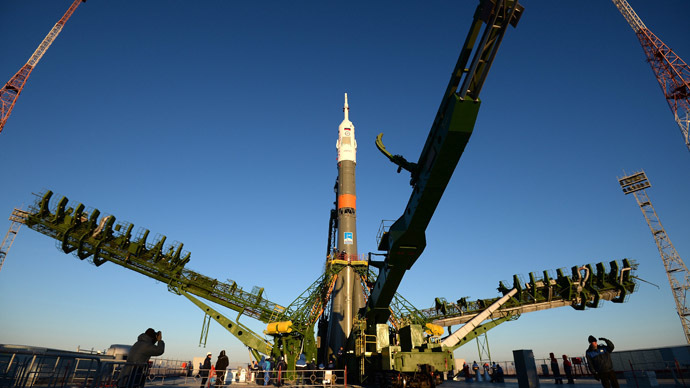 A new version of the rocket – Soyuz-2.1b was launched from Baikonur Cosmodrome on December 26, 2014. Resurs-P No.2, which was placed into target orbit by the rocket, can video Earth’s surface with a resolution of up to one meter in panchromatic mode (non-color). It’s also capable of registering cosmic radiation. Currently Baikonur launches about 20 space rockets annually. Among them are famous Proton rockets which literally have their ups and downs. The first rocket of the Proton family was launched in 1965. Over the last five years there have been several unsuccessful attempts to launch Proton rockets. A Proton-M rocket carrying three GLONASS navigation satellites crashed after takeoff from Baikonur in July 2013. In May 2015, the launch of the Russian Proton-M rocket went wrong when its telemetry seized. The rocket and its payload, a Mexican communication satellite, burned up in the atmosphere. Watch more in RT's Madina Kochenova report on the history of the Baikonur Cosmodrome.